My kids love rice crispy treats and so do I. They are so easy to put together when we need a quick snack or dessert. Did you know that you can make rice crispy type treats out of just about any type of cereal? It is a great way to use up cereal that you have bought on sale or maybe cereal that your family did not like very much or that they are tired of. Over the years I have used fruit loops, golden grahams, honey bunches of oats, captain crunch, and many others. I recently started doing this with gluten free cereals like Chex and that also works well. I just follow the basic directions for making the treats and use whatever cereal that I have. What is your favorite cereal to use for these rice crispy type treats? 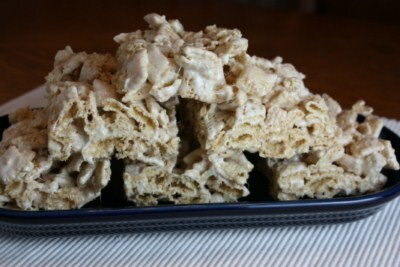 For a fun and unique rice crispy treat you should try Amy’s Rice Crispy Roll and Jen’s version of rice crispy treats. They are both fun versions of a classic treat. When I was in college, the dining hall had these made out of honey nut cheerios, and one made out of golden grahams. The golden graham ones were sooooooooo good! .-= Jen´s last blog ..Blockbuster Online = FAIL =-. I read this post this morning and it was all I could think about all day. So guess what we had for desert??? Yep, and made with Cocoa Krispies yum-o!! .-= Julie Anne´s last blog ..Successful dinner-recreating LO’s with pantry staples =-.